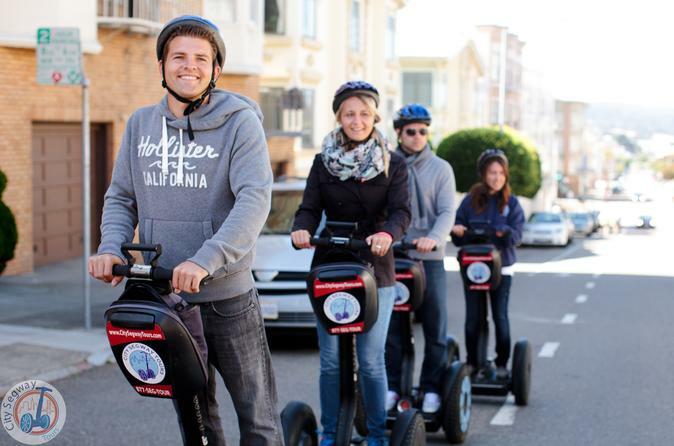 If you have always wanted to hop board a Segway and experience the joy of gliding along, this 2-hour tour of San Francisco provides an excellent opportunity. After an orientation, follow a guide on your self-balancing electric scooter and capture views of Alcatraz and the Golden Gate Bridge while making your way through North Beach to Ghirardelli Square. At your scheduled departure time, meet your guide near Pier 45 at Fisherman’s Wharf. After a safety briefing and orientation session on your personal transporter, set off on a 2-hour route with plenty of photo stops before you return to the pier. Take in views of the Golden Gate Bridge and Alcatraz from Fisherman’s Wharf. Glide past Ghirardelli Square, world-famous for its chocolate, and see the historic marine vessels at Aquatic Park’s Hyde Street Pier. Your guide points out an authentic San Francisco cable car and the towering Transamerica Pyramid, a distinctive landmark in the Financial District. Other San Francisco points of interest include Coit Tower on a ride through Washington Square Park in North Beach.